The applications are endless. With fire water tanks, the water has to be kept ready to pump year-round, in case of emergency. Such tanks often require the ability to swap out the heater without draining the tank, which we can do. In other applications, tank contents need to be kept at a particular temperature for process recipes or catalyst reactions. Harsh or aggressive chemicals must be heated with a low watt density, so the process doesn’t attack the heater and shorten element life. And, of course, there must always be a control panel, which can be mounted remotely or on the heater itself and communicate back to the customer’s SCADA. Flange immersion heaters are easy to install and maintain. Designed for heating liquids and gases in tanks and pressure vessels, flanged immersion heaters are ideal for applications requiring higher kilowatts. Flange immersion heaters are made with Watlow's WATROD or FIREBAR tubular elements brazed or welded to a flange. Stock flange heaters are equipped with a general purpose terminal enclosure. 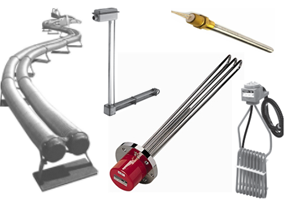 Flanged immersion heaters, with FIREBAR elements, also answer the need for liquid immersion applications requiring high kilowatts in small tanks. Over-the-side heaters are ideal for heating water, oils, solvents, salts and acids. Application versatility is enhanced with optional sheath materials, kilowatt ratings, terminal enclosures and mounting methods. The L and O shaped “installed-from-the-top” heaters slide easily into tanks, with the heated portion immersed along the side or at the bottom. The drum immersion heaters are designed for direct immersion in a standard 55-gallon steel drum. Watlow vertical loop immersion heaters are well-suited for open tank applications. Screw plug immersion heaters are ideal for direct immersion heating of liquids, including all types of oils and heat transfer solutions. Available in a variety of sizes, Watlow screw plug immersion heaters feature both WATROD round and FIREBAR flat tubular elements. Heating elements are hairpin bent and either welded or brazed into the screw plug, depending on element sheath and plug material compatibility.